I'm looking for an old comic with Scrooge McDuck I think, or maybe Donald Duck. I read it in French was I was young (late 80s or beginning of the 90s). because he is so scary and intimidating, with his big scary look, that the player in front of him loses all his confidence and kind of forfeit. 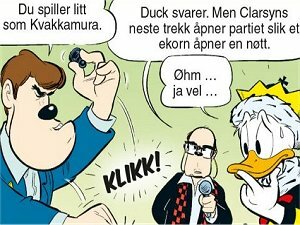 There is this recent (2014) Donald Duck encounter with Magnus Carlsen, the world chess champion. However, it's not clear if it was produced in any languages other than Norwegian. Not the answer you're looking for? Browse other questions tagged story-identification comics disney or ask your own question. Are there Humans in Mickey Mouse and Donald Duck Comic Books? 80s/90s fantasy book: female protagonist, demon-related magic, “knife”/“blade” in title…? Has Darkwing Duck ever met Scrooge McDuck?